Planting in autumn was perhaps a little foolhardy even with the mild winters we’ve had here lately. I’m not sure why I didn’t wait until late winter or early spring, but I guess I had my reasons, maybe that the “Windsor” variety was allegedly hardy to below 20 degrees. The few nights into the low 20s here wounded the tall fava “stalks” but didn’t kill them; most would crimp somewhere up the main stalk and fall over, only to start growing upright again. The end result is basically fava stalk spaghetti, a real tangle of mangled green. Regardless of the shape of the plants, the key operative is the word “green”; green means they are very much alive. Not only are they alive, they are now completely covered with blooms, an early treat for the pollinators venturing out as the days and nights slowly begin to warm up. No beans arrive without blooms first, so it looks like these are at least on the path to productivity. The good news is that these plants are legumes (as vetch actually, not a true “bean”) and have been adding nitrogen to the soil of their beds all winter. 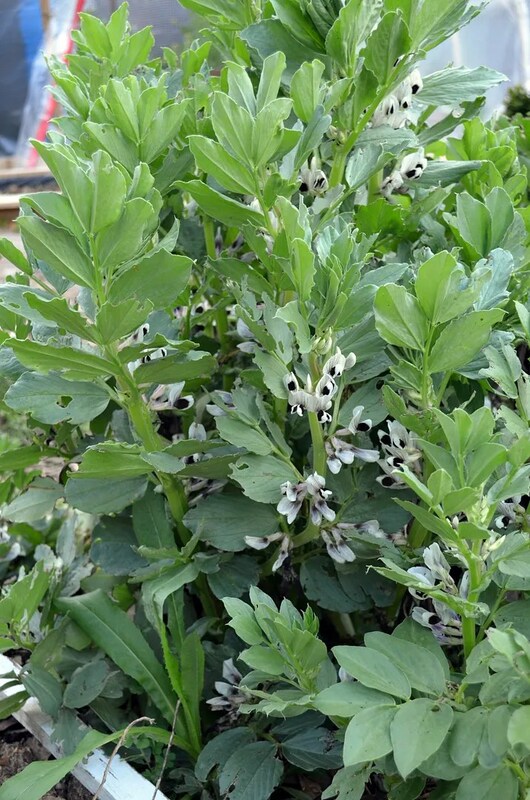 This is why favas and other vetches are used extensively as a winter cover crop in commercial agriculture. Since I have “crops” (as established in the first line of this post), I could claim that these were not planted last fall out of ignorance, but rather as a wise and forward looking soil improvement / cover crop project. Yeah…. a cover crop, that’s the ticket. Great crop – bummer about the double shelling. That sort of moves them down in the desirability ranks. You call them fava, we call them broad beans. Either way I love em. You’re awesome….. great blog! The end.